Important...READ THEM... Don't just vote if you haven't read the documents and understand the budget. If you have questions... ASK. Read & understand fully first. Vote in poll last. If any item isn't clear, then don't vote in that poll. The above are prioritized based on staff recommendations. There will be 28 polls. Last edited by Rick Di Lorenzo on Tue Jan 11, 2011 11:38 am, edited 1 time in total. I have to post this, although it should be obvious. Please use this poll (and any online poll) with a big grain of salt. Online polls can be skewed. Don't take this as an accurate representation of the 'electorate'. Treat this as an 'informal' poll. Please contact your local (and local & regional) councillor and give him or her your input directly on the budget. Any discussion threads, polls, online forums etc should take a secondary seat between direct communication between yourself and your local, local & regional, mayor, and any other elected representatives in your area. To try and prevent poll skewing and tampering things have been configured so only existing forum users with a history of online discussion participation will be able to vote. Newly created user accounts with little forum activity will not be able to vote in these polls. Once again these polls are informal, for informational or entertainment / educational purposes only. I'd like to ask the people who've voted so far if they are in favour of ANY spending by Town Officials. So far, most of the votes are to kill/not implement any spending. For example: Why eliminate spending to go after deliquent accounts? That makes no sense to me at all. I want those accounts paid. That's "spending money to make money." That's good spending. Page 10 of the Introduction, Building Permits, notes that "The 2011 Operating Budget includes an estimate of 1,500 new units." 2009 was 1,766. 2010 to October was 1,232. Is there now a more accurate number for 2010? What is the $$ impact on the 2011 Operating Budget if the estimate of building permits was increased from 1,500 to 1,600 for example? There was 1418 new home permits issued in 2010 down 19.6% from the 2009 total of 1764 new homes. Staff are again projecting 1500 new homes for 2011. Not much difference in the revenue for 100 homes as the majority of revenue comes from industrial and commercial projects which there may be several this year. Attaching the 2010 tax rate comparison for GTA municipalities for everyone's information. Average assessment $ 300,000 per house. Also please note that the Town's portion of your tax bill is 27%, the region's portion is 45% and the boards of education is 28%. Check www.halton.ca and type in Tax Estimator at the site search icon and click on the link and type in your address to see where your property tax dollars are going. Colin, I really think it is time to quit spinning those tax comparisons every year. Bury the old t-shirts. It ain't workin'. To make a meaningful comparison you would have to include other factors such as the average assessments in each municipality, region/local totals, and the $6 million per year that Milton receives from Mohawk (declining, but still about 20% of Milton taxes collected). If your point is that Milton taxes should be higher, just say so. 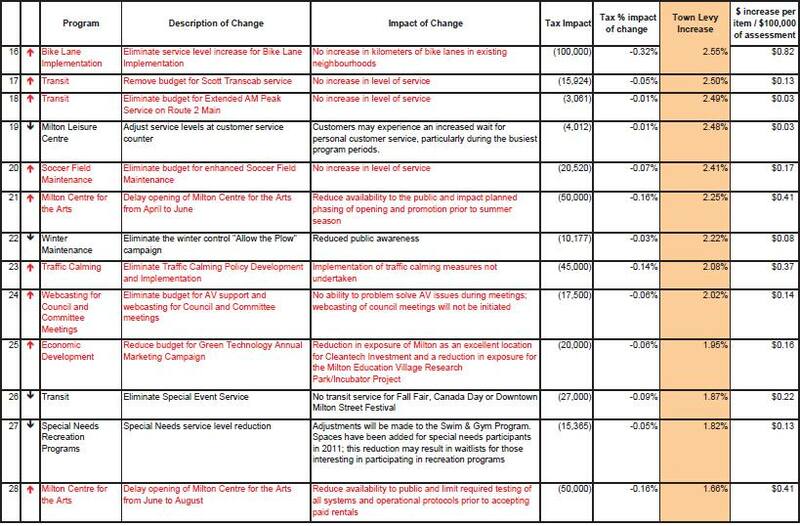 If your point is that past Milton councils have been really tough at budget time, well good luck with that too. Looking forward to your budget proposals next week. Soon we will see this become true. I was going through the budget and saw that some net costs are going up a lot from a cost per capita perspective. See below. Note, population estimates are from the town's/region's population estimates. 1. Cost to operate Recreation and Parks has gone up 25% per year, per capita, for 2 years straight. 2. Cost to operate the Executive Services department, in particular the Office of the CAO. 3. Cost of the libraries. Some costs would be expected to increase in line with population (like libraries). Others should be lower than population growth as they benefit from economies of scale (Office of the CAO). If costs are growing faster than population (Recreation and Parks) it may indicate inefficiency, adding new services, expanding facilities too soon, or all of the above. I can't tell from the budget documents why these 3 areas look wonky but they present good budget questions for our councillors to ask. The $1,270k increase in Recreation and Parks 2010 to 2011 includes $1,639k in Salaries and Benefits and $668k in Purchased Services, offset by a $1,584k increase in Total Revenue. This area gets most of the 25 increase in staff count but what explains the rest of the changes? 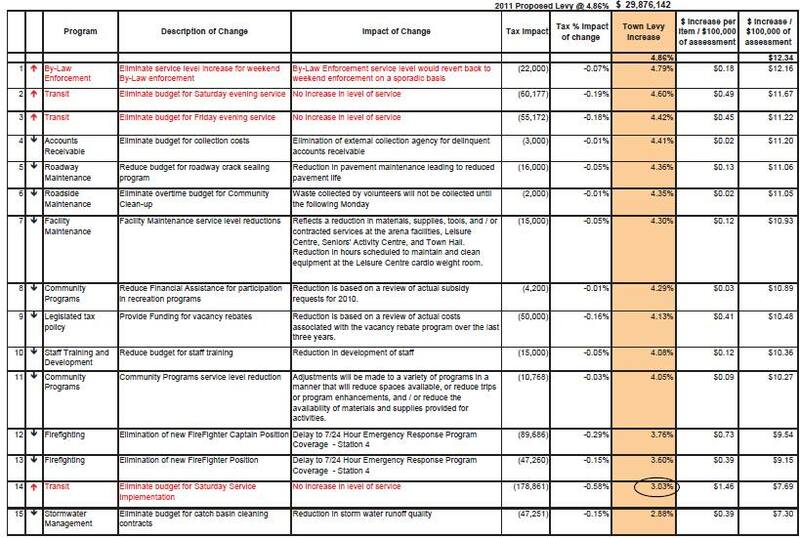 The $314k increase in the Office of the CAO from 2010 to 2011 includes $106k in Salary and Benefits (more staff or higher senior salaries?) and a $173k reduction in User Fees and Service Charges. I can't find detail to explain any of this.